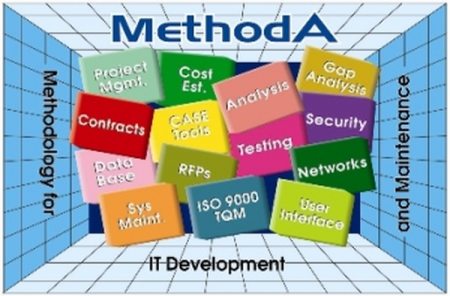 MethodA is a framework for overall IT management in organizations, spanning the project level to the organizational level. At the project level (individual system), MethodA defines the management, development, maintainance, and operation of IT systems of any type and scope - systems under development, systems being maintained, IT systems and infrastructure systems, complete system or “lean” system, tailored turnkey systems or off-the-shelf software sold and installed with minor adjustments and customization. At the organizational level, MethodA provides methods and tools for executive management, including annual work plans, project tracking (PMO), management of requirements and tasks, overall information management (OCIO), and overall strategic planning or oursourcing. At both levels, the project and the organizational level, the MethodA approach represents both a framework and an open methodology. In other words, MethodA provides extensive and comprehensive knowledge and clear guidelines for project management, yet leaves a wide berth for adjustments and changes, enabling the organization to incorporate its policies with MethodA. MethodA outlines the steps and expected deliverables throughout the project lifecycle – from initiation and characterization of the system, to design and build (or procure and customize), to systems tests, to installation, operation, and maintenance. These tools are incorporated in the MethodA framework in the form of advanced Excel tools and work templates. In addition, they are incorporated in modern development platforms, such as Atlassian tools (Jira) and others. MethodA Cloud – This website is an open verson of MethodA and is designed to introduce users to the methodology and for trial use. Some parts of the methodology are not fully activated.